There is an old saying that Wyoming’s Powder River is “a mile wide and an inch deep.” Well, we have a horse that is four feet high and ten feet deep! Buddy is a little horse. No, he isn’t little – just short. No, not short – just built close to the ground. He is thick, he is solid, and he is determined. I’d first bought him as a kid’s horse for a “gentleman rancher.” He impressed me with his eagerness, willingness, drive, and personality the first time I rode him – that’s why I named him Buddy. But he bucked off the girl I had bought him for, so I took him up to the West Boulder. His stature officially qualifies him as a “pony.” But height doesn’t measure heart. Buddy has a wide, deep girth – which contains a tremendous set of lungs, and a heart. It was almost as if he set out to prove the world wrong about whether he is a kid’s pony or a “by God” HORSE. And he did prove himself over the next several years as both a cutting horse and as a cover-the-country working cow horse. When cutting cattle out in the field, Buddy would stop, drop, and roll back from any speed in pursuit of an ornery cow. In the corral he opened and shut gates, and he handled with all the finesse necessary to sort any class of cattle, and to push them up into the chute. Our ranch is not particularly big, but it is steep and rough. In the summer range he matched the miles with my half- thoroughbred “Kentucky Colt.” Buddy never hesitated to charge out after a bunch-quitter or ornery bull – over, under, around, and through the rocks and sage, uphill or downhill. And he never, ever ran out of steam. When you were on Buddy, you were horseback. 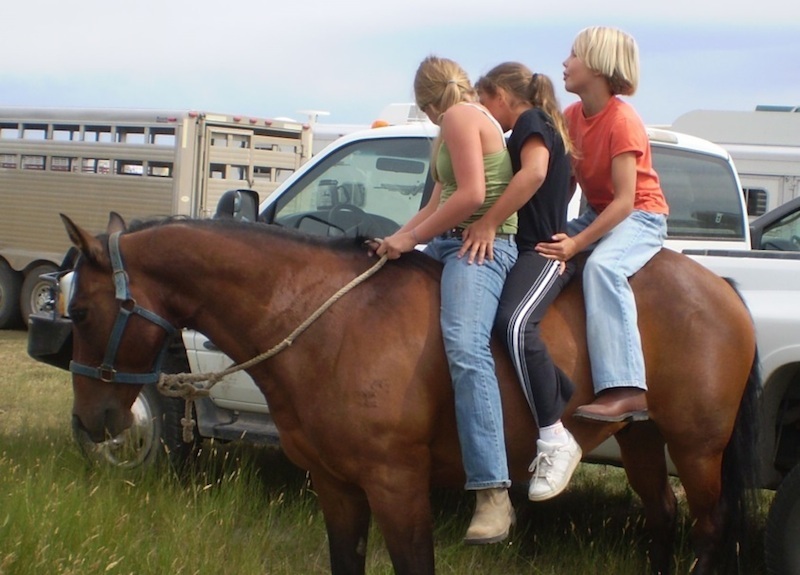 Buddy was our smallest horse – yet he led the remuda. But Buddy was as gentle a horse as God ever made. He was the first horse to the corral when there was work to be done, and the first to put his head in a halter. Anyone could ride him and everyone did. He read people as well as he read cows – giving no mercy to a cow or a cowboy, taking advantage of a “wannabe,” yet taking care of a respectful novice rider. Every horse is different – some remarkable for their good points and some remarkable for their bad. Buddy will remain in the hearts of everyone who has ever met him. For more stories from Kent Hanawalt, check out his book, Ain’t This Romantic!?! : Adventures of a Twentieth Century Cowboy, available on amazon.com.